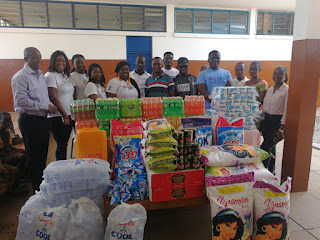 US based gospel singer and minister; Herty Corgie made a donation to the Dzorwulu Special School on Tuesday, February 26, 2019 in a bit to lend support to the government run facility which caters to the needs of students with special needs. Corgie, who is a budding musician is based in the US state of Maryland with her husband and children but keeps keen interest in happenings in her Ghana home country. It is on her recent visit that she opted to lend a helping hand to the Dzorwulu Special School based in Dzorwulu where she resided while in Ghana. 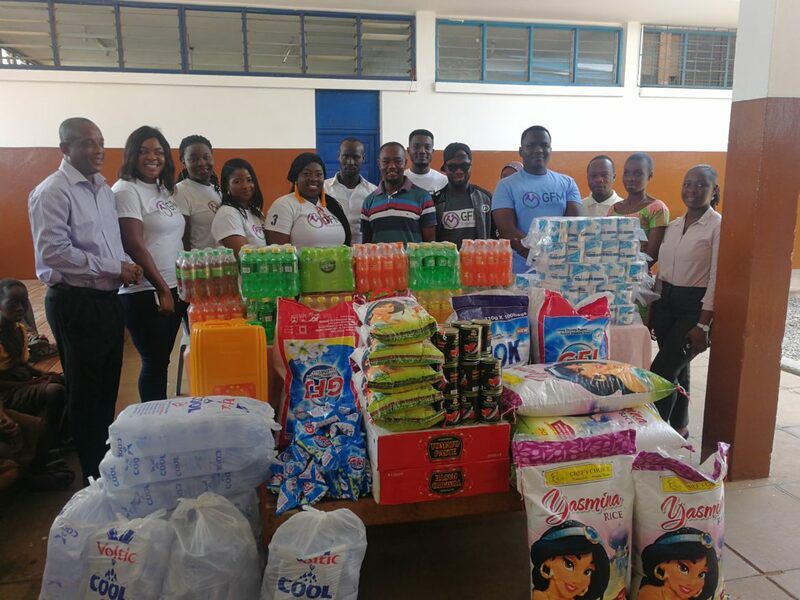 Items presented to the school include packs of fizzy drinks, gallons of cooking oil, bags of rice, bags of sachet water, detergents, toilet papers, cartons of canned tomatoes, canned fish and a few other items. Assistant headmaster of the school, Freddie Tetteh who received the items expressed gratitude calling on other non-governmental organisations and philanthropists to support the school with nutritious items and educational materials. He submitted the 160 students in the school are trained to possess skills they can use to earn a keep when they graduate from the school adding the students are trained in agriculture, carpentry, car washing, sewing, bead making and cooking of local dishes. The special educators who instruct the students in education are drawn from the University of Ghana, University of Cape Coast and the University of Education, Winneba – UEW. Mr. Tetteh stated as a government run boarding facility, they enjoy subvention from the state as well as a beneficiary of the free education scheme. He however pointed out that the school could do with instructional materials as the students require a one-on-one interactional mode of knowledge transfer as they don’t fare well with abstract teaching. The teaching and non-teaching staff number about 45 and while some stated they had apprehension dealing with the students, they’ve since learned to adapt and wouldn’t have it any other way. Intellectual disability (ID) is characterized by below-average intelligence or mental ability and a lack of skills necessary for day-to-day living. People with intellectual disabilities can and do learn new skills, but they learn them more slowly. Herty Corgie supported by her Herty Corgie Music team after the donation mentioned her ‘GraceFoundMe’ nonprofit organisation registered in the US about the two years ago supports humanitarian projects both in Ghana, the US and other countries like Haiti. The Ghanaian coordinators; Faustina Ofori Armstrong and Lebene Adjoyi were in session for the donation as was emerging music act, Carl Clottey. Corgie in the weeks ahead will release two new tunes whiles staging the Overflow Concert on June 2, 2019 at the Grace2Grace Centre in Maryland, USA.